Inspired by the Greek royi, this oil and vinegar dispenser brings timeless design to the table. 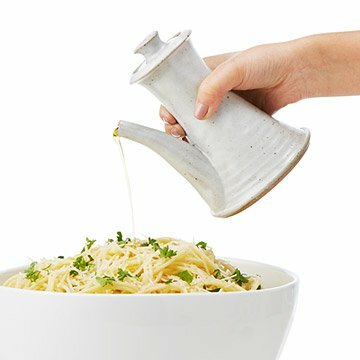 Inspired by the Greek royi—an hourglass-shaped oil server found in every Grecian home—this stoneware oil and vinegar dispenser brings timeless design to your table. It was also inspired by one of potter Daniel Bellow's friends who imports olive oil from her family's ancestral trees. Daniel's rendition features a narrow neck that's easy to hold, and a subtle glaze that will complement any decor. Handmade in Great Barrington, Massachusetts. Pair your Olive or Vinegar Stoneware Pourer with our Pure Extra Virgin Olive Oil. Daniel Bellow's pottery is hand-thrown on his potter's wheel in a 19th-century carriage barn in the Berkshire Hills of Massachusetts. His work is all about form. He single-glazes his pottery and lets the kiln do the rest. The kiln in question has a reduction atmosphere, which yields uniquely rich glazes. Daniel notes that "things that are made by hand have a life of their own, a spirit that machine made objects, no matter how well designed, are lacking. Surround yourself with useful, beautiful things made by real people. A life well-lived is itself a work of art." A good looking and practical oil dispenser! I use the dispenser for olive oil. It is a good design. It looks more attractive on the counter, instead of keeping a bottle there. The design is attractive, as well as practical. The wider bottom keeps the dispenser from toppling over, I also like the slightly wider opening, because you can see when to stop while filling the can. We wanted an attractive olive oil container that could sit on the kitchen counter (because it's used frequently), be easily wiped down and refilled, and didn't leak all over the place. This is EXCELLENT. It's small, attractive, and does all of those things. I use olive oil often in my cooking. This dispenser is handy and cute clustered with the other necessities next to my stove.